Of course, this storm decided to move farther north and closer to the coast then predicted. As a result, double-digit snowfall totals are now possible in many parts of the Hudson Valley by tonight. Snow will continue today, heavy at times, with near white out conditions possible with any wind gusts. This will remain all snow today, with no mixing expected. The snow by end by midnight tonight. I think travel will be fine around the Hudson Valley by late morning on Sunday. HOWEVER, today I would plan on staying indoors. The worst of the weather will continue to be the farther south and east you go here in the Hudson Valley. HV SNOW ALERT: A fast moving area of low pressure is going to brush the Hudson Valley with some rain and snow showers after midnight tonight. Expect the activity to start as rain, but as colder air works into the storm, the rain will change to snow showers after 3am. Any snow shower activity will be gone by 8am Friday morning. Accumulations will range from a coating to 2”, with best chance to see the higher accumulations the farther east you go here in the HV. This situation is changing rapidly this afternoon, and if the front sets up closer to the coast, we could see a bit more snow and a bit farther west. Light snow will develop during the morning hours on Monday. By mid-afternoon Monday, a coating to 2” of snow is possible, with the highest amounts the farther east you go here in the Hudson Valley. Snow, mainly light, will then continue into Monday evening, tapering off by midnight; around 1” of additional snow is possible Monday evening. This will make the total snow from Monday and Monday evening 1” to 3”, with the highest amounts the farther east you go here in the Hudson Valley. Tuesday will feature some flurries/light snow with little to no accumulation during the day. A steadier light snow may develop Tuesday night into Wednesday with an additional round of minor accumulations possible. This is a tricky forecast, so stay close for updates as we head through the next 72 hours. Light snow will gradually overspread the Hudson Valley from east to west this morning. Occasional snow, mainly light, will then continue into this evening. The snow will end by midnight tonight. As you can see from the above map, snowfall accumulations will be a coating in the far north west, to maybe 3" in Southern and Eastern Westchester County. Temperatures will be hovering right around freezing during today, and with the snow staying mainly light, I think main roads should be fine for travel through this afternoon. Stay close to News12.com for LIVE updates all day. Another round of snow is possible later Tuesday into Tuesday night, with some more light accumulations possible overnight Tuesday. More on that as we head through the next 24 hours. More snow is heading to the Hudson Valley tonight into Wednesday morning. Snow will become likely after 7pm this evening here in the Hudson Valley. Occasional snow will then be with us overnight. With temperatures in the 20s overnight, the snow will stick to all surfaces. The snow threat will gradually end Wednesday morning, and by 10am should be totally done here in the Hudson Valley. As you can see from the above map, accumulations will be a general 1" to 3" here in the Hudson Valley. 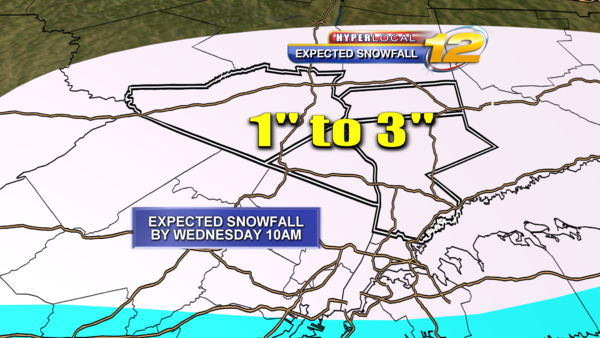 Stay close to News12.com for LIVE updates into Wednesday morning. 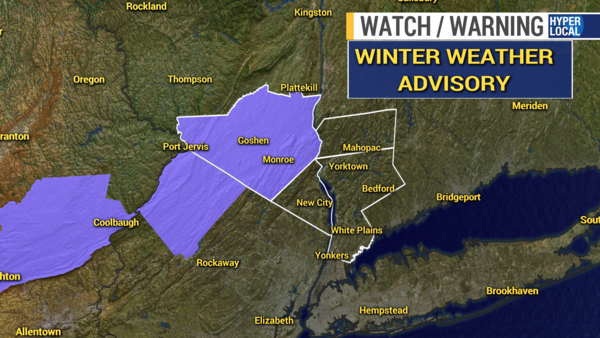 HV STORM UPDATE: A wintry mess of snow, ice and rain is headed to the HV! Right now, it looks as if snow will develop in the early to mid afternoon on Monday and continue into Monday evening. Initially, temperatures will be cold, so the snow will stick to all surfaces. Snow will change to plain rain between 7pm and 10pm Monday, with maybe a brief period of ice. 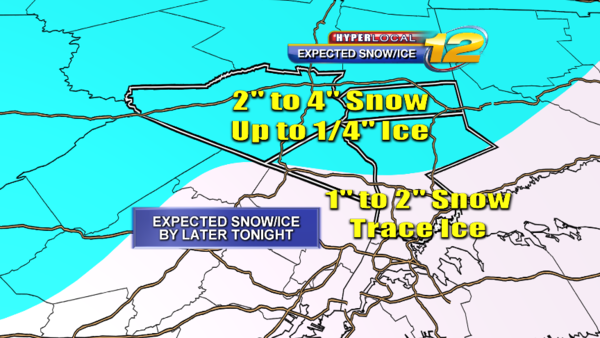 Total snow expected South of I-287 before the changeover will be 1” to 2”. The ice will then change to plain rain from 10pm Monday night to 6am Tuesday morning. Total ice expected before the changeover will be 1/8” to 1/2”. Driving will become very hazardous Monday night in places being affected by ice. By 6am Tuesday morning, plain rain will be affecting all of the HV, as temperatures will be above 32F. Rain, heavy at times will then be possible into Tuesday evening. Roadway flooding is definitely possible on Tuesday. 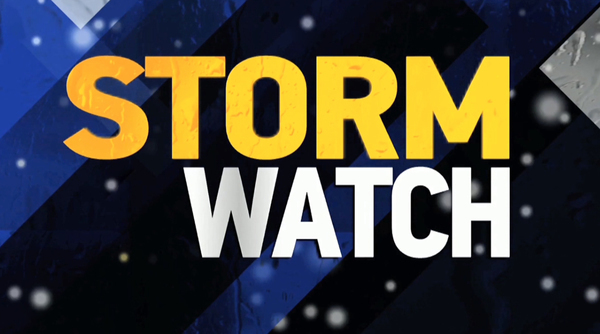 HV STORM UPDATE: A wintry mix of snow, ice and rain is headed to the HV! Snow will develop in all of our communities by 3pm this afternoon, with snow then continuing into this evening. The snow will change to plain rain between 7pm and 10pm this evening, as temperatures climb above 32F. There could be a brief period of ice before the changeover to plain rain. The ice will change to plain rain between 10pm and 4am Tuesday morning, as temperatures climb above 32F slowly from south to north. By 4am Tuesday, all of our communities here in the lower Hudson Valley will be experiencing plain rain, as temperatures climb above 32F. Rain, heavy at times, will affect all of us on Tuesday, with some roadway flooding possible. Snow or a rain/snow mix will continue into this evening here in the Hudson Valley. Temperatures should be above 32F this afternoon, so I feel main, treated roadways will be OK for travel at least through 5pm or 6pm this evening. The snow or rain/snow mix will end this evening, as drizzle or freezing drizzle, between 7pm and 10pm. Drizzle or freezing drizzle will then be with us overnight, with any freezing drizzle transitioning to plain rain by the morning commute on Wednesday. As you can tell from the above map, snowfall totals will be light. HV SNOW ALERT: Could this be winter's last gasp? We shall see...Spring will be in the air next week here in the Hudson Valley, but before that, we have a little snow heading our way. Right now, snow showers will develop around midnight Thursday night and last until around noon on Friday. Accumulations at this point look to be a Coating to 1". There could be some snow covered roadways for the morning commute on Friday. But I think the roads should clear by later Friday morning, as temperatures climb above 32F. Light snow will develop around or shortly after midnight here in the Hudson Valley. Temperatures will be below 32F tonight, so any snow will stick. The light snow will continue into the morning commute on Friday and end by later in the morning on Friday. As you can see from the above map, snowfall totals are expected to be on the light side here in the Hudson Valley. While there could be some snow covered roadways for the AM commute on Friday, I am not expecting major problems on the roads. With the warmer weather, the spring allergy season has gotten off to an early start this year here in the Hudson Valley. Allergy season is in full swing here in the HV! Here is your Thursday morning allergy report. 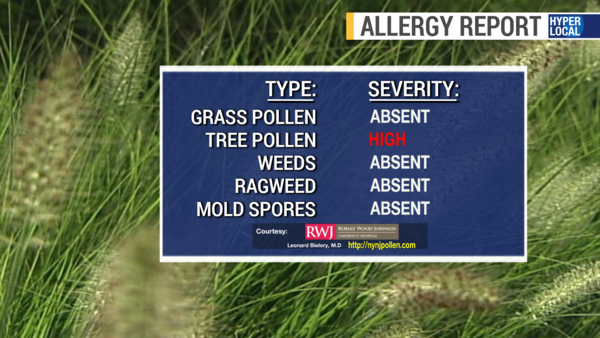 Here is your UPDATE Wednesday morning allergy report for the Hudson Valley. HV SNOW ALERT: Spring arrives Sunday here in the HV, but Mother Nature may have other plans! Right now, it looks as if snow will develop during the late morning hours on Sunday. The snow may mix with rain at times during the day Sunday. Temperatures on Sunday will be near 34F, so I feel roadways will just be wet on Sunday through 6pm. I wouldn’t cancel plans for the day on Sunday at this point. After 6pm Sunday, any snow will begin to accumulate on the roads, as temperatures drop below freezing. The snow should end by daybreak on Monday. RIGHT NOW, up to 6” of snow is possible here in the Hudson Valley. I don’t see much more than 6” of snow at this point, in fact, I see less. BUT THAT COULD CHANGE!! The exact track of this storm is still in doubt. A track closer to the coast could bring more snow, but also maybe more mixing with rain. A track farther offshore, and we may not see that much in the way of snow. 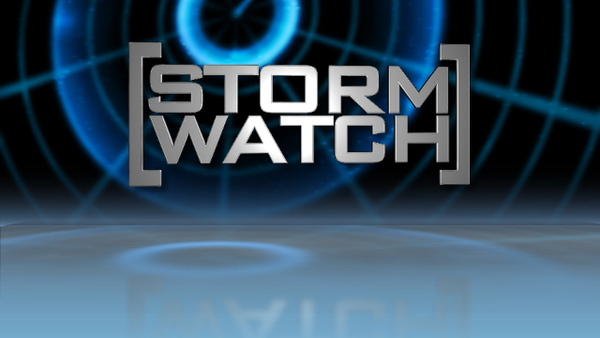 So PLEASE, stay close to News12 and News12.com over the weekend for updates. This is a tricky and low confidence forecast at this point. I will provide updates over the weekend as well. HV SNOW ALERT (Updated Saturday 6AM): Models are converging on the track of the storm that brings little to no snow to the Hudson Valley! That’s right, the two models I talked about last night that brought us a general Coating to 2” look to be right, as the other two models are lowering their totals. Light snow or flurries will try to develop early in the afternoon on Sunday. There will be no snow accumulation through at least 6pm on Sunday. Sunday night, we may get clipped by some light snow/flurries as the storm passes well out to sea. Total snow looks to be a Coating to 2”, with more folks seeing a Coating as compared to 2”. At this point, I see little issues Sunday night on the roads here in the Hudson Valley. There may be some flakes around, but at this point, I think its business as usual for Sunday, Sunday night and into the morning commute on Monday. Here is your Tuesday morning allergy report for the Hudson Valley. The spring snow washed some of that tree pollen out of the air! 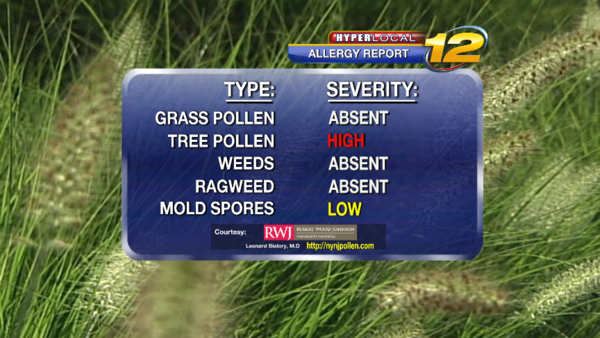 Here is your UPDATED Thursday morning allergy report for the Hudson Valley. 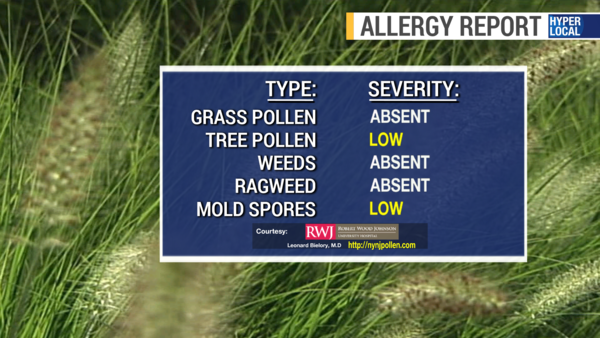 Here is your Friday morning allergy report for the Hudson Valley. 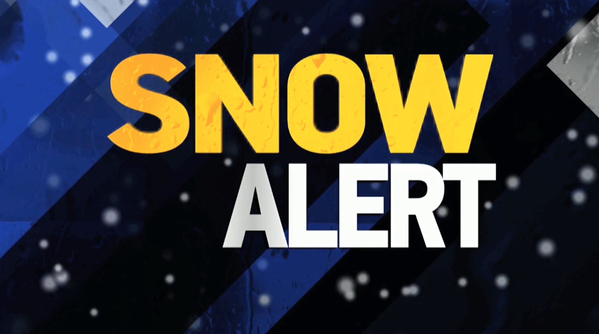 HV SNOW ALERT: Some more snow is headed to parts of the HV tonight, as our fast moving pattern continues. 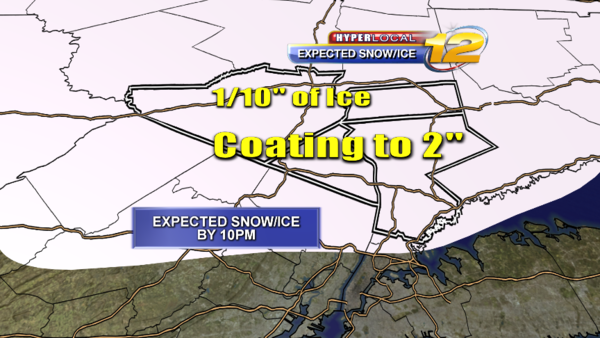 Expect mainly light snow to develop after midnight tonight here in the HV. Unlike last night, temperatures will be around or below 32F, so some minor accumulations on un-treated roadways are possible very late night. Any snow will change to plain rain by 9am on Monday. The rest of Monday will feature rain showers, with highs in the 40s. 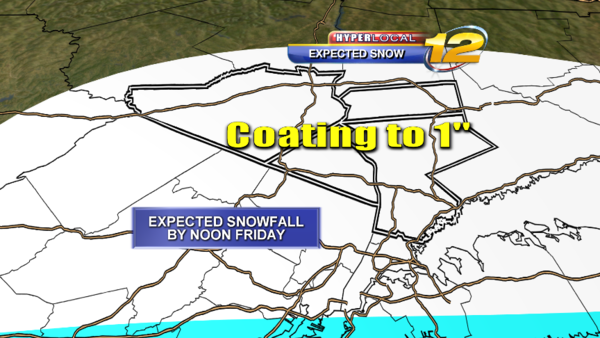 For locations South of I-287 you can expect a Coating. 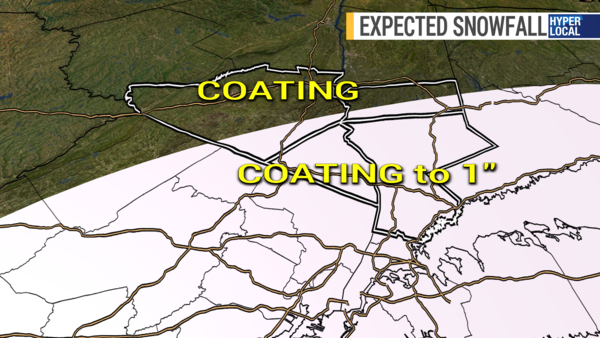 Between I-287 and I-84, you can expect a Coating to 1”. Along and North off I-84, up to 2” of snow is possible. Most of the main, treated roads should be fine for travel Monday morning, so I am not expecting major problems for the Monday morning commute. However, some scattered school delays could be possible, especially the farther North you go here in the HV. Here is your Wednesday morning allergy report for the HV. HV SNOW UPDATE: Please do not cancel plans for Saturday, unless they are outdoors, as roadways will be fine for travel through the day on Saturday. With that being said, some spring flakes are possible once again here in the Hudson Valley on Saturday. Rain and snow showers will arrive late morning here in the Hudson Valley. Saturday afternoon will feature occasional snow and/or rain showers, that will end in the evening. Temperatures will be in the lower 40’s Saturday afternoon, so any snow will not accumulate on the roads. However, a Coating to 1” of snow is possible in some of our communities on colder surfaces. IN ADDITION, a few of the models keep most of the activity just south of us here in the Hudson Valley. So there is still a chance we do not see much of any rain or snow. Here is your Tuesday morning allergy report for the HV. This morning Supervisor Christopher P. St. Lawrence stepped down as Chairman of the Rockland County Solid Waste Management Authority. He stated that he was extremely proud of his 17 years with the Authority. He will remain a Board member as required by law. By stepping down the good work and effort achieved by the Authority will continue without disruption. NEW BRUNSWICK:- Spring time ushers in the arrival of grass pollens, the most common summer allergen, but before we get there, there’s the tree season. Over the next two weeks, birch and oak pollen will explode, with counts reaching into the thousands of grains per cubic meter air,” says Leonard Bielory, M.D., a specialist in allergy and immunology with the Rutgers Center of Environmental Prediction at the School of Environmental and Biological Sciences, and Robert Wood Johnson University Hospital. Bielory is also the principal investigator at Rutgers of a U.S. EPA Climate Change and Allergic Airway Disease study. According to Bielory, the robust precipitation over the winter and the record-reaching snowfalls will bring a vigorous birch and oak pollen season, set to start the week of April 18 for birch tree pollen, followed by oak tree pollen by May 1. Allergy sufferers can read actual pollen counts by visiting www.nynjpollen.com. They can also correlate their symptoms with weather and air quality (including ozone and particulate matter) using a unique app, Asthma Ally™, which also monitors allergies as it is commonly linked to asthma. The free mobile app is downloadable to iPhone, Droid or Windows-based devices. AsthmaAlly™ is an electronic diary on which allergy and asthma sufferers can monitor their health and collect health data that can be sent to their doctors or other health care provider. Another great tool is the new Raphael (Angel of Health) Personal Medical Record app at iTunes. Here is your updated allergy report for Tuesday, May 17th. As you can see from the accompanying rainfall map from NOAA's Weather Prediction Center, the lion's share of Hermein's rains will fall south of the Hudson Valley. Perhaps up to an inch of rain could fall south of Interstate 287 in lower Westchester; much lighter amounts to the north and west. WATCH A NASA ROCKET LAUNCH THIS EVENING! -- As some of you may already be aware, tonight there is going to be an Antares rocket launched from Wallops Island, Virginia by Orbital ATK. This is a resupply mission (OA-5) to the International Space Station. This attempt . . . the first such mission since an Antares rocket crashed back onto the Wallops launch pad shortly after liftoff nearly two years ago . . . is set to be launched at 7:40 p.m. EDT. There is a five minute launch window. Unlike resupply missions by the Space Shuttle which were launched from Cape Canaveral, northeast along the Atlantic Seaboard, tonight's launch will be launched in a southeast direction away from the Mid-Atlantic Coast. The rocket launch should be visible from South Carolina up to southern and central New England including our own Tri-State Area, provided skies are clear and prospective observers have a clear and unobstructed view of the south-southeast horizon. Generally speaking, the rocket should become visible locally about 111 seconds after it leaves the launch pad at Wallops Island. I have included a link below, which will help guide you in observing the launch. Skies are expected to be clear, so good visibility is expected. 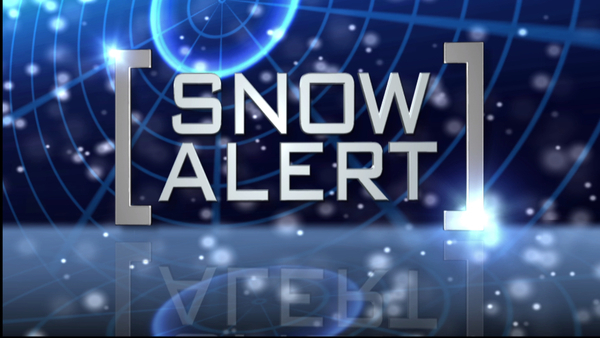 HV SNOW ALERT: A quick burst of mainly light snow is likely after midnight. The snow will gradually change to rain in most spots before ending later Monday morning. Temperatures will hover in the lower to middle 30’s, so treated roadways should be just wet. However, some roadways in your local community could be snow covered come daybreak Monday. Accumulations will range from a Coating to 1” here in the Hudson Valley, with the best chance to see 1” the farther north and west you go. Temperatures come Monday afternoon will reach into the lower 40s. HV SNOW ALERT: (UPDATED 12:00PM) Forecast from this morning is on track according to the latest computer models this afternoon. Snow, or a mix of snow and rain, will develop around 7pm this evening. The snow or mix will quickly change to plain rain. 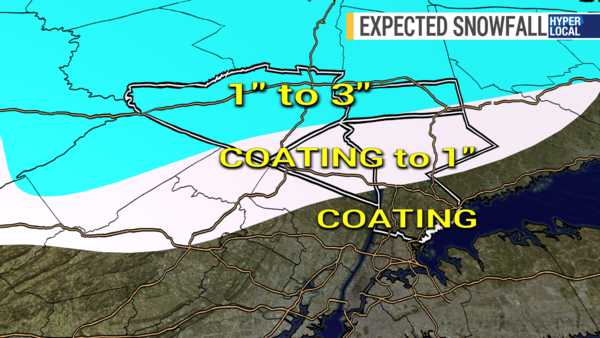 Snow accumulations in Westchester and Rockland Counties should be around a Coating. Snow will develop between 7pm and 9pm this evening. The snow will not change to rain until after midnight. Snow accumulations in Orange and Putnam Counties will be a Coating to 2", with possible 3" amounts in elevations over 800' in Orange County. HV WINTER WEATHER UPDATE: A wintry mess of snow and rain is headed to the Hudson Valley for Sunday night and Monday. Light snow/flurries will break out around 4pm. However, any snow will stay very light; Accumulations of snow through midnight will be under 1”. THEREFORE DO NOT CHANGE PLANS FOR TODAY! Travel should be fine into the evening. After midnight, the snow will turn a bit heavier. However, by 6am Monday morning most locations South of I-287 will be experiencing plain rain. Total snow accumulations will be a Coating to 1”. So while there could be some scattered delayed opening, most locations South of I-287 will have a business as usual Monday. After midnight, the snow will turn a bit heavier. The snow will change to rain from south to north between 6am and 10am Monday morning. Total snow accumulations will be 1” to 4”, with the best chance to see 4" in Northern and Western Orange County. HV SNOW ALERT: Here are my preliminary thoughts for Friday night into Saturday. Snow will develop after midnight Friday night. Snow will continue into Saturday morning. After 7am Saturday, the snow will begin to change to rain from south to north. By 12pm Saturday, plain rain will be affecting the entire Hudson Valley, as temps warm to near 40 degrees. Before the changeover to rain, 3" to 6" of snow is possible here in the Hudson Valley. Sunday will feature plain rain showers with highs up near 50F! HV WINTER WEATHER UPDATE: A Winter Weather Advisory is in effect starting at Midnight and lasting into Saturday morning. Snow will develop after midnight tonight. The snow will stay rather light until 4am. After 4am, the snow intensity will pick up here in the Hudson Valley. After 7am Saturday, the snow will begin to change to rain from south to north. By 12pm, the entire Hudson Valley will be seeing plain rain with temps above 32F. Rain showers will continue Saurday afternoon into Saturday night and Sunday as temps continue to rise! By Sunday, temperatures will be peaking in the 50s. HV WINTER WEATHER UPDATE: Here are my thoughts on what you can expect on Thursday. Snow will develop Thursday morning between 7am and 9am. The snow will quickly mix with and change to rain by noon. Periods of rain will then fall during the afternoon, possibly ending as snow by 7pm. Temperatures will be above freezing all day on Thursday, so treated surface will see little to no snow accumulation; Untreated surfaces will see a coating to 1" of snow. Snow will develop Thursday between 7am and 9am. Snow will then mix with rain as we head into the afternoon. Any mix may end as all snow by 7pm. Temperatures will stay above 32F, so treated surfaces will see little to no snow accumulation; Untreated surfaces will see 1" to 3" of snow. Light snow will develop here in the Hudson Valley between 10pm and 1am tonight. Occasional snow will then continue overnight. The precipitation will remain all snow everywhere, with temperatures in the 20s. The snow will taper off Friday morning between 7am and 10am. As you can see by the above snowfall map, accumulations will be a COATING to 1" with the best chance to see 1" in Southern and Eastern Westchester County. 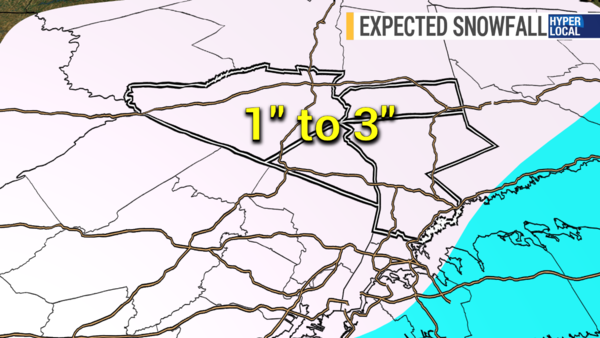 An isolated 2" amount is possible along the immediate Sound Shore. Colder air working back into the HV tonight is turning what was expected to be a mostly rain event into another wintry mess on Sunday. It looks like snow or snow & sleet will develop between 5AM and 8AM Sunday morning. Snow or a wintry mix of snow and sleet will continue for much of the morning. 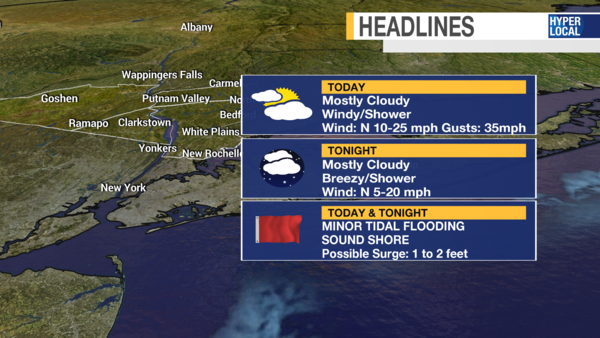 By early to mid afternoon, most of Rockland and Westchester Counties will have changed over to mainly rain. 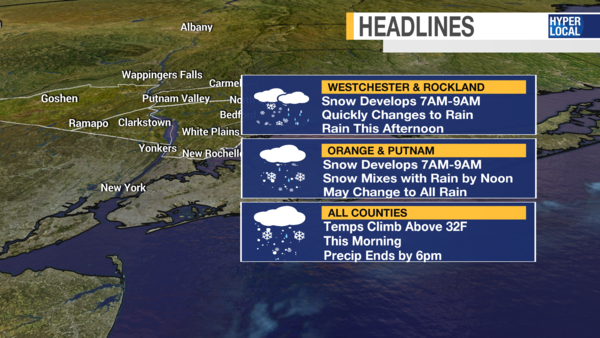 In Orange and Putnam Counties, a wintry mix will continue Sunday afternoon. All the activity will end by 8PM Sunday. 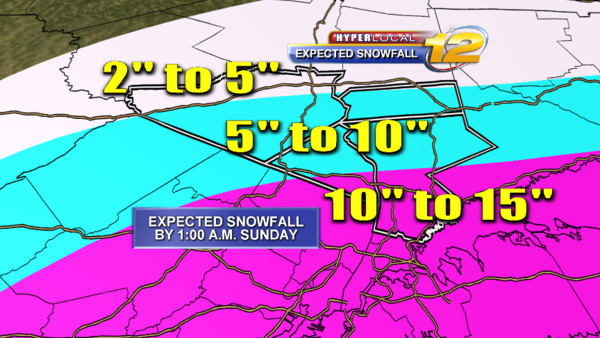 For those living South of I-287, 1” to 3” of snow/sleet is expected. For those North of I-287, 2” to 5” of snow/sleet is possible. MARCH MADNESS IN THE HV! After a mild Thursday, snow is on the way for Friday moring. A mix of rain and snow will develop here in the HV around midnight Thursday night. That wintry mix will change to snow by daybreak Friday, as colder air works into the HV. Snow will then affect us Friday morning and will taper off mid-to-late morning on Friday. At this time, I would prepare for 1" to 3" of snow. This is a HIGHLY VARIABLE forecast and we still have some time to watch this fast moving system. MARCH MADNESS HERE IN THE HV! After temps in the 50s today, we have snow on the way for tonight and Friday. A mixture of rain and snow will develop around or shortly after midnight. Any wintry mix will quickly change to all snow, with the entire HV seeing all snow by 5AM. Temperatures will be near 32F. The snow will continue Friday morning and should end by 12PM. It looks as if 2" to 5" of snow will be possile here in the Hudson Valley. More updates to follow today if conditions change dramatically. 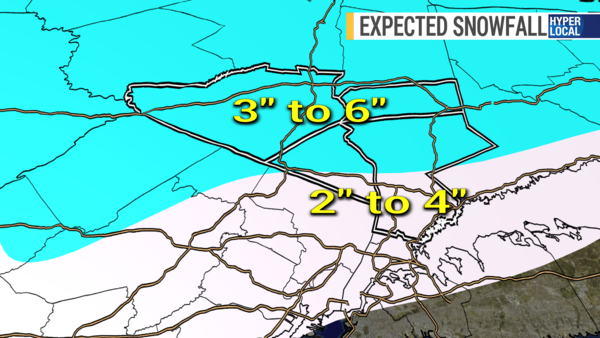 HV SNOW UPDATE: March madness continues as more snow is headed to the HV on Tuesday. Snow develops Tuesday morning between 2am and 4am. The snow will end Tuesday afternoon between 4pm and 6pm. At this time, I do not see much mixing here in the HV so this looks like predominately snow for us. Total snow accumulation for the HV looks to be 8” to 16”. I would assume no school on Tuesday for most of our districts here in the HV. HV BLIZZARD UPDATE: Get ready for a snow day on Tuesday. 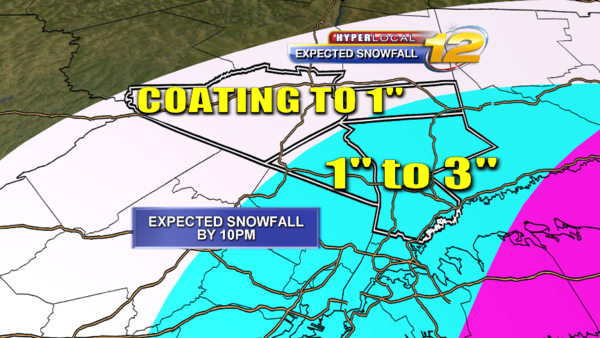 Snow will develop here in the HV between 1am and 3am Tuesday morning. Heavy snow along with strong wind will then last for most of the day on Tuesday. At this time I see little to no mixing here in the Hudson Valley. The accumulating snow will end Tuesday late afternoon between 4pm and 6pm. 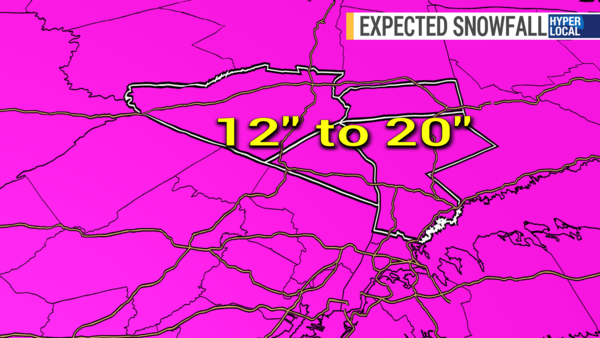 Total snow looks to be anywhere from 12" to 20" here in the Hudson Valley! WOW! SATURDAY SNOW UPDATE: A very tricky forecast for the Hudson Valley, as a Norlun Trough is expected to impact our weather. Before 5pm on Saturday only spotty light snow mixed with rain is expected. There will be little to no snow accumulation through 5pm Saturday. I do want to stress that. I would not change or cancel plans you may have during the day on Saturday. After 5pm Saturday, the precipitation will be mainly snow and will begin to fall a bit heavier and steadier. Periods of snow will then continue Saturday night and end very early Sunday morning. 1" to 3" of snow is possible here in the Hudson Valley, again mainly Saturday night. However, these norlun troughs are tough to forecast and so localized higher amounts of snow are possible.